Air Force Capt. 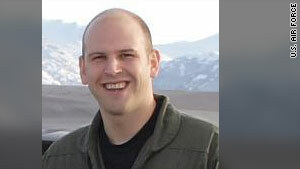 Jeffrey Haney was killed Tuesday when his F-22 crashed in Alaska. Washington (CNN) -- Search-and-rescue teams have found "conclusive evidence" that the pilot of an F-22 aircraft that crashed while on a routine training mission in Alaska did not survive, the military said Friday. Air Force Capt. Jeffrey Haney, who was assigned to the 525th Fighter Squadron, 3rd Wing, has been missing since the crash Tuesday night. Crews have found the wreckage of the plane. Haney "did not eject from the aircraft prior to impact," said Air Force Col. Jack McMullen, 3rd Wing commander. McMullen made the remarks Friday in written and video statements. A recovery team found part of the ejection seat and several life support items that Haney wore during the flight. "If a pilot was able to eject, the seat would go with him and it would not be anywhere at or near the site," McMullen said. "Sadly, we can no longer consider this a search-and-rescue operation, but must now focus on recovery operations," McMullen said. "This is a huge loss for the 3rd Wing and for the Air Force, but it's even a greater loss ... and a very emotional time for the entire Haney family," McMullen said. "We are doing everything we can to support them right now." Officials are looking into the cause of the crash and the recovery operation is expected to last several weeks. The wreckage was discovered Wednesday, a day after the aircraft lost contact with air traffic control, according to officials from Joint Base Elmendorf-Richardson at Anchorage, Alaska. The plane was found near a creek bed between two mountains, about 100 miles north of Anchorage, near Denali National Park. The Clarklake, Michigan, native was commissioned in the Air Force in August 2003 and had been stationed at the base in Alaska since June 2006.